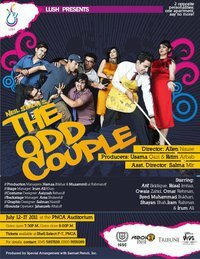 LUSH in collaboration with the US Embassy in Islamabad presents its latest theatre play, The Odd Couple! Allen Nause, an American theatre/film/TV director & actor has come to Islamabad to direct this play. The play will be staged from 12th July till 17th July 2011 at The Pakistan National Council of Arts, Islamabad. Tickets available at Shell Select F-7 & at PNCA. Each ticket costs Rs.600. For bulk/group buying and discounts, please call 0300-5555089. Based on the Broadway play by Neil Simon, this tells the story of two mismatched friends, Felix Unger and Oscar Madison. Felix is a neat, tidy, and healthy nut, a photographer at a portrait studio, and a connoisseur of classical music. Because of this, his wife divorced Felix and threw him out of his apartment for good. Desperately in the need of a place to live, he moves in with his longtime childhood friend, Oscar Madison, a sports journalist for the New York Times. What he realizes is that Oscar is the exact opposite of him: sloppy, messy, and doesn't eat the right foods. Felix's cleaning, hygienic tips, and healthiness annoys Oscar while Oscar's crazy world of living like a pig upsets Felix. But in the process they'll learn that love, trust, and friendship are more important than living in different worlds.